Take exit 28 from Route 80 or follow Route 183 in Netcong. Nine miles in length and covered by 2,500 acres of freshwater, Lake Hopatcong is the focal point of the park. Hopatcong State Park is at the southwest end of the lake and is a popular spot for fishing, boating, and swimming. However, as the more efficient Morris and Essex Railroad was established, the canal was abandoned. The historical museum is located in the old Morris Canal locktender’s house and offers exhibits on local American Indian history, the Morris Canal and the history of the lake. Through the Carry-In/Carry-Out Program you can help us keep your parks clean and beautiful by carrying out the trash you carry in. Bags are provided at the park office and toll. Thank you for your cooperation and remember to recycle. The facilities at Hopatcong State Park are partially accessible for persons with disabilities. Please contact the park office for further information regarding specific disability access needs. Text telephone (TT) users, call the New Jersey Relay Service at (800) 852-7899. Sunrise to Sunset from Tuesday after Labor Day to the Friday before Memorial Day Weekend. 8 a.m. to 8 p.m. from the Saturday of Memorial Day Weekend to Labor Day. Update: The State Park Service began Spring Refill of Lake Hopatcong on Saturday, March 16, 2019. Entrance fees are charged per vehicle from Memorial Day weekend to Labor Day. Please be advised that when we reach full capacity/run out of parking spaces, the park will temporarily close until enough people leave and it is safe to re-open. Park Pass and Boat Pass holders are not guaranteed entry when the park reaches full capacity and is temporarily closed. We recommend that you arrive early on warm weather weekends in June, July and August. 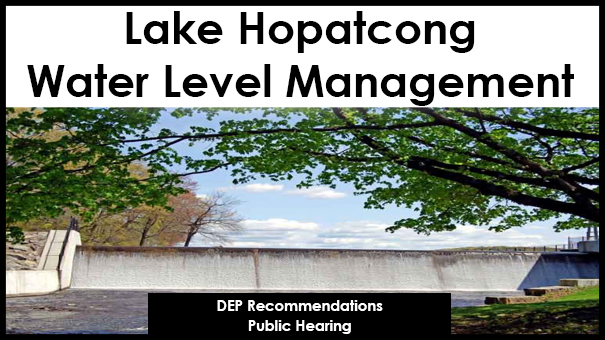 Per the Water Level management plan we will begin the annual drawdown of Lake Hopatcong on December 7, 2016. This year we will drop the lake to 22 inches as part of a pilot project effort to assist in lake refill in the Spring. Also note that after reaching 22 inches, due to the drought warning that we are in, that the outflow will be reduced from 12 c.f.s to 8 c.f.s. As always, State Park personnel will carefully monitor this drawdown. 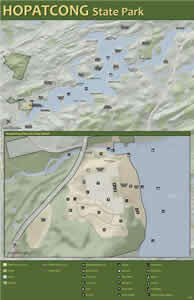 LAKE HOPATCONG DOCK SURVEY - In the Fall of 2014 Professor Lisa Jordan of Drew University and two of her students, Maxwell Dolphin and Daniel Ratyniak, completed a survey of all docks and associated parcels on Lake Hopatcong. The survey includes such information as dock lengths, parcel lots and blocks, street address, property owner names, etc. The survey was performed in conjunction with the State Park Service (SPS), and the Lake Hopatcong Foundation. The survey is important to the SPS in that it provides baseline data as SPS reviews dock construction permit applications, and for the current dock regulation committee, which is reviewing SPS regulation of dock lengths on the Lake. Having this baseline data may also prove useful for future applications. The full report, "A Summary of Docks on Lake Hopatcong", can be accessed at http://www.lakehopatcongfoundation.org/wp-content/uploads/2014/12/LHF-Boat-Dock-Inventory-December-2014.pdf Full access to dock study results is available via website links found on page 11 of the study, though a review of the full report is very valuable. The SPS thanks Dr. Jordan and her students for such a thorough study, as well as the Lake Hopatcong Foundation for coordinating the effort. Completed in 1837, the Morris Canal was an engineering landmark that relied on canals, locks and inclined planes to lift and carry canal boats from Phillipsburg on the Delaware River to Jersey City, the Hudson River and New York Harbor. The boats transported coal, iron ore, manufactured goods and agricultural produce. Sections of the canal are administered by Hopatcong State Park. During the mid-1800s, the Morris Canal and Banking Company created Lake Musconetcong as an additional water source for the Morris Canal. This lake, which is located four miles west of Lake Hopatcong, was deeded over to the State of New Jersey with the other parts of the Morris Canal System in 1924. Today boating, fishing and ice fishing are popular recreational activities on this lake. Both Lake Hopatcong and Lake Musconetcong offer excellent year-round fishing. During the spring the New Jersey Division of Fish and Wildlife stocks both lakes with brown, rainbow and brook trout. Warm water species commonly caught are large mouth bass, sunfish, catfish, perch and pickerel. During the winter months, both lakes provide excellent ice fishing for perch and pickerel. Fishing is subject to New Jersey Division of Fish and Wildlife regulations. This park has been designated a NO HUNTING area. The park has several picnic areas along the hill overlooking the parking lot. At each picnic area, visitors will find grills and tables. There is a small picnic shelter and playground located on the hill. Alcoholic beverages are prohibited. The park has two playgrounds for children along with six half-basketball courts and sand volleyball. In addition, there is a large playing field ideal for soccer, frisbee or just about any field activity. Lake Hopatcong provides an excellent opportunity for any type of boating, ranging from canoes to large motor boats, sailboats, sailboards and jet skis. Boats are available for rent at many private marinas around the lake. Boating is subject to New Jersey Boating Regulations and Marine Law. There is a boat ramp available at Hopatcong State Park. Boating is open seven days a week depending on parking availability. There is a boat ramp with parking available at Lake Musconetcong. This site is open from sunrise to sunset seven days a week. • Fees charged at Hopatcong State Park beginning on April 1 through the Friday before Memorial Day weekend; and beginning the day after Labor Day through October 31. Swimming is permitted at Hopatcong State Park in the designated swimming area while lifeguards are on duty. Please check our swimming schedule prior to your visit. There is a bathhouse complex containing restrooms, showers, changing areas, a first aid room and concession where food and beach supplies are available for purchase. Grilling is limited to the picnic areas only. Grills are not permitted on the lawn areas. There are two sand volleyball courts and a playground near the beachfront. For safety reasons, inner tubes, rafts and other flotation devices are not permitted in the bathing area. Only Coast Guard approved life jackets are permitted. Pets are prohibited on the beach. Bus Reservations are accepted Monday through Thursday, please forward your bus reservation application to the park office fax at 973-398-6521. Thank you. Can we bring a bus to Hopatcong State Park on weekends? Buses are permitted on Monday through Thursday only (excluding holidays and Weekends) by written reservation. Can I walk in when the park is filled to capacity? When the park is full to capacity the park is closed to everyone until a sufficient number of visitors leave for the day. Can I leave the park and come back when the park is full? If visitors leave the park and come back when the park is full, they will not be able to enter until the park reopens. Where do I put my trash when I carry it out of the picnic area? The carry-in carry-out program requires a park visitor to take their trash home and dispose of it through their local trash collection service. Can I get a special permit for alcohol? There are no permits for alcohol in the NJ State Park Service.